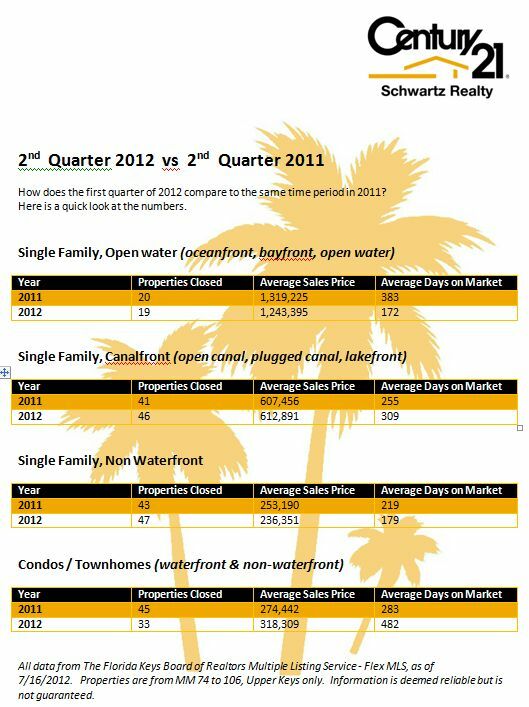 Florida Keys Market Update: 2nd Quarter 2012 versus 2nd Quarter 2011 - The market is improving! 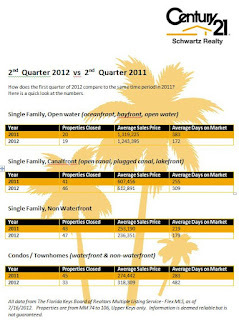 2nd Quarter 2012 versus 2nd Quarter 2011 - The market is improving! 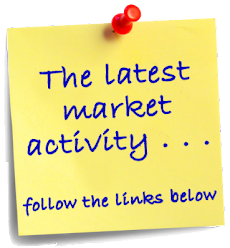 As soon as people I meet find out I am a Realtor, they want to know how the market is doing. Lately, I'm proud to say it's doing really well, with prices starting to inch back up. A quick look at the numbers for closed sales during the 2nd quarter of the this year compared to the 2nd quarter of 2011 shows that prices in most property categories are rising. Open water homes and dry lot homes have seen slight decreases, but both are selling quicker than they did in 2011. With quicker sales, I suspect these numbers will increase in the 3rd and 4th quarters of 2012. Canalfront homes have seen a slight up-tick in sales prices. In fact I updated a CMA I did for one of my sellers and found that the CMA actually came out higher than it had just 4 months ago. If you're considering purchasing a home on a canal or harbor, now is the time to do so. Condos appear to be taking longer to sell than they did in 2011, but the sales prices are moving upward. In the past, condos have been slow to sell when there were a lot of "good deals" on single family homes for comparable money. As the inventory shrinks and fewer single family homes are on the market, condos will become a good choice for second home purchasers, particularly those looking for amenities such as pools, fitness centers, beach access, etc.